“Sorry, you didn’t have any direct deposits this month” or “Sorry, you made one too many withdrawals out of your savings account last month.” Of course, there is also the infamous, “Sorry, you used a non-network ATM.” Not only am I charged from my own bank for withdrawing my own money but from that of an out-of-network ATM as well. If I’m traveling outside of my home country I also get pegged with a foreign transaction fee of a couple percent on top of those two fees. After all this I really start to feel like I just got ripped off. It’s my own money and I shouldn’t be charged for accessing it. When you travel outside of your home country for any extended period of time those banking fees really start to add up. Take, for example, the fees I would pay from my home bank while I’m gallivanting from country to country. I usually withdraw money from ATM about once a week. My home bank charges $2.50 per withdrawal and, on average, I’m usually charged $3.00 from a foreign ATM. In the past year I would have been charged $286 just to access my own money before accounting for the foreign transaction fee. To avoid all of this I’ve compile a list below of some decent banking options to help save some travel funds when you want to access your own money abroad. I had to draw some line in the sand as to which countries I would include in this study, so I’ve limited it to the English speaking countries of Australia, Canada, the United Kingdom, and The United States. As a long-term traveler you have left you current job and have no current income. No income means no direct deposits, so you are looking to save every penny you can. This means many of those fancy accounts where you receive added perks if you deposit a certain amount of money into your account each month go out the window. Also, I’ve left out some banks with high monthly fees. Some banks below do have monthly fees or will want you to deposit a certain amount of money each month to avoid the monthly fee but I’ve only included those that could be advantageous to the long-term traveler in these cases. As I’ve alluded to above, the common fees that you will be charged while traveling abroad are ATM fees and foreign transaction fees accessed by each bank. In all the searching I’ve done I haven’t been able to find too many great options for Australians. It seems as if you’re limited to two options: National Australia Bank’s Gold Account and a WestPac account which would use the Global Alliance ATM Program. Neither is perfect but your best choice would probably be NAB’s Gold Account. On the NAB account there is a $10 monthly fee which can be waived if you deposit AU$5,000 into the account each month. If you have this amount of cash my recommendation would be to deposit the amount into your account and then transfer it back out again. You can repeat this process each month with the same $5,000 to have the fee waived. Even if you end up paying the $10 each month you should still be saving in comparison to using a standard account. For example, a normal NAB account will charge you $4.00 per withdrawal plus a 2% foreign transaction fee. If you take out at least two ATM withdrawals per month, you will be saving money using the Gold Account. Your other option is a WestPac account and their Global Alliance ATM Program. The Alliance program is an association of major banks throughout the world which allow for free ATM usage. If you use an ATM outside of the Alliance program you will be hit with a $5 ATM fee by WesPac plus a foreign transaction fee of 3% and a possible foreign bank ATM fee. Between the two accounts, NAB is clearly the better option as it gives you more freedom while traveling. All you have to do is find an ATM with a Plus logo. In the past the clear option for Canadians was Citizens Bank, but in 2009 they folded up shop and left all those internationally traveling Canadians with almost no good options. In all my searching I’ve found one bank that provides a fairly decent deal outside of the Global Alliance ATM program provided by Scotiabank. ICICI Bank of Canada is a Canadian subsidiary of one of India’s largest banks. Their target market is clearly Indians who transfer money back home but there is no reason why anyone else can’t sign-up for an account. Their HiVALUE Plus Checking Account offers free transactions anywhere in the world through the Cirrus network, but has a monthly fee of $9.95. Though the fee can be waived if you keep a minimum balance of $500 in the account. They also provide an interest rate of up to 0.50% depending on how much money you keep in the account and unlimited free checks. From what I can determine in their terms and conditions, they also do not charge any foreign transaction fees. Another option for Canadians would be TD Canada Trust’s Select Account, but with a monthly fee of $29.95 unless you have a minimum balance of $5,000 I can’t recommend them. If you have this kind of cash maybe this account could be right for you, but a $29.95 monthly fee will usually outweigh the total amount of ATM fees you would otherwise be charged in a monthly period by any other bank. Sorry to say it but that leaves Canadians with few great options. The next best option would be to check with your credit union if you are a part of one. While not perfect, credit unions generally provide lower fees and are often easier to work with than the larger banks. In the past, Nationwide’s FlexAccount was the clear choice but today the choice isn’t quite as easy. There is still a lot of ‘old chat’ on the internet about how great this account was, but now that they have added a £1.00 ATM fee and a 2% foreign transaction fee they’re no longer the clear favorite. Some better options would be Norwich and Peterborough Building Society’s Classic Gold or Gold Light Account or Metro Bank. The issue with both of these banks is that their home network of brick and mortar institutions isn’t very large. The two Norwich & Peterborough accounts are similar but differ in two main areas. The first being the way in which the £5 monthly fee is waived and the second being fees and policies regarding overdraft protection. The Classic Gold also throws in a few extra perks, but both accounts don’t charge non-network ATM fees or foreign transaction fees. In the Classic Gold account the fee is waived if you add £500 to your account each month or have a balance of £5,000 or more. Similar to NAB’s Gold Account in Australia, you can simply transfer £500 in the account each month and then transfer it out again and repeat the process each month. A bit of a hassle but it saves you the monthly fee. To avoid the fee in the Gold Light account you need to make 5 transactions a month or have a balance of £5,000. In the London area there is Metro Bank ,which has recently opened it’s doors. This is the best bank for English travelers that I’ve come across, with no monthly fees and little hassle. If a small, new bank doesn’t bother you and you live in the London area then this may be a good option for you. Outside of banks, another option that English travelers have are pre-paid cards which function the same as a debit/ATM card and are easy to use. I haven’t found any hidden fees or surcharges and it seems very straightforward to use. The most popular is the Caxton pre-paid card, which is free to order. If traveling to Europe or the US they have special Euro or Dollar cards in which you lock in the exchange rate before you travel. The money is then converted onto your card at that rate. If you will be traveling internationally they also have a Global Traveler Card. 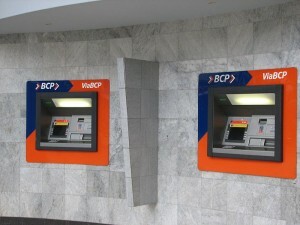 There are no ATM fees charged, but they take 2.75% below the current exchange rate. On the plus side the base exchange rate they use is better than most banks in the UK. Another Pre-pay card that seems to be worth a look is Kalixa. They haven’t been around as long as Caxton but are very competitive. The card costs £4.95 but they charge no foreign transaction fees though will charge £2.25 for each use of an ATM, which will usually work out be a smaller fee than the 2.75% charged by Caxton. It’s odd that the best banks for travelers are located in the US when typically you don’t run into as many Americans abroad as you do Brits or Aussies. The top two accounts for travelers that I’ve come across in any country are Charles Schwab’s High Yield Investor Checking Account and Fidelity’s mySmart Cash Account. I have met a few travelers with one of these accounts and none have had anything bad to say about them (myself included). Both are surprising in that they aren’t normal banks but brokerage firms. These accounts are aimed at people who are investing with the firm so to apply for either account you need to first open up a brokerage account, but there are no rules regulating that you actually have to use the brokerage account. These are also the only banks I’ve come across that will reimburse the ATM fees charged by foreign banks. They also provide a small rate of interest on your account. Both firms also have great reviews when it comes to customer service. Of the two accounts, Charles Schwab is slightly better as it doesn’t have a foreign transaction fee, whereas Fidelity charges 1.00% of the withdrawal amount. Charles Schwab also provides a slightly better interest rate. Similar to the other countries mentioned above, there is a US bank that is part of the Global Alliance ATM Program: Bank of America. Although, if you’re opening up a new account I’m not sure why you wouldn’t just open up one with Charles Schwab. Another option is to get a PayPal debit card if you don’t want to change banks. You can use this debit card similar to the Pre-paid cards described above for England. Simply transfer money into the account and your free to withdrawal it anywhere in the world that accepts MasterCard. There will be a $1.00 fee for withdrawing your money in the USA or a 1% transaction fee anywhere else in the world. Unfortunately, there is also a 2.5% foreign transaction fee on top of this, but you may still be better off using this than your home account, depending on their fees. To safeguard your travel funds and keep you globetrotting I recommend two other pieces of advice. 1. Use two accounts. If you lose your card or your info is taken using an ATM swiper you can lose a serious amount of cash. To avoid this, I use two accounts. My travel account and another main account which automatically deposits money into the travel account on a regular schedule. I don’t travel with my main account ATM card. This way there is no way for a person to access my main account. If someone does accesses my travel account they will never have access to the bulk of my travel funds, and all I would need to do is cancel the transfers and close the compromised account. 2. Always use an ATM attached to a bank. Can you imagine walking up to an ATM in a foreign city and having the ATM eat your card? Not good. Especially if it’s a stand-alone ATM machine in some store or on a street corner. How can you easily get your card back? Maybe a number is given to you on the screen or on a piece of paper that is spit out at you, but there may not be. If you go to an ATM that’s attached to a bank you can avoid all of this. Simply walk into the bank and tell them the ATM ate your card. In this scenario you can have your card back within a matter of hours. I am here in Sosua, Dominican Republic again, and I am always baffled by the number of people exchanging cash and not using an ATM. However, what an ATM does force a person to do is stay under 300 USD per day budget. I know that people use credit cards because they can go way over budget and not have problems. Personally, I only go to the ATM one time per week, I know my budget from the size of my pocket money. You feel to be working a lot Wade, hope life is good. Ooop, I see this is a guest post. Yes, this is absolutely amazing to me as well. Many people don’t seem to know that they can stick their card in the machine and get money when abroad. True though, ATMs do put a cap on spending — they also make travel seem a little more like “real life” as well. I think just dumping everything on a credit card without regard coincides with the “travel as hedonism, don’t worry about tomorrow” take that many tourist seem to have. Can’t say I blame them. If I worked 50 weeks a year dreaming about my two week vacation, I’d probably live it up as well. For the record, I use a credit union that doesn’t charge any withdraw fees. I pay a 1% transaction fee from Visa, and if the ATM I’m using doesn’t have a separate fee, that’s it. I remember calling and complaining to my bank about the %1 fee a couple of years ago (as they use to absorb it), but now I know how good I have it compared to the Canadians and other travelers from English speaking countries. Yeah, I have been working a lot here. Trying to set the site up for the new era of the internet that we’re in. Though there is still a lot of free time for friends and family, and I’m in a place that is almost too nice to even write about haha. It is funny how much things being stuck in your “craw” can provoke writing haha. Travel writing is perhaps most difficult when the living is comfortable and good. I guess this is the irony of the profession. Anyway, I’ve been hiring other writers as well. Trying to make the site truly global rather than just being centered on wherever I am in the moment. FYI Charles Schwab runs credit checks for opening a checking account that have to meet their bank’s guidelines. I’m checking right now to see if Fidelity does the same. Thanks for this note. That’s good to know. Do you know if the credit check is difficult to pass or is it just a parameter to ensure that you’re not completely irresponsible in that regard. Funny that they would do a credit check as you are giving them your money. Keep us posted on what you find out with the Fidelity account. Thanks. Credit checks are standard procedures in Canada too. For Canada (where I am), you should also look at ING Direct (http://www.ingdirect.ca)… a virtual-only bank, without any fees of any kind. And of course, it’s affiliated to the huge ING bank. I’m preparing to enter this lifestyle (currently in the process of selling my stuff and early planning). I’ve also opened an account with Scotia Bank because it’s very present in Central America apparently (and all the major Canadian banks are heavily present in the Carribeans). This is some great information for a newbie. Glad I hit on it.